Namibia is perhaps the most scenically spectacular country in southern Africa. The main highlights of Namibia are the dramatically beautiful landscape, and the opportunity to meet one of Africa’s most traditional cultural groups. As an added bonus, Namibia is also home to some fascinating species of desert wildlife, including Africa’s only desert elephants and desert rhinos. Namibia’s four prime destinations are the Skeleton Coast (and Kunene River), Sossusvlei, Damaraland, and Etosha National Park. 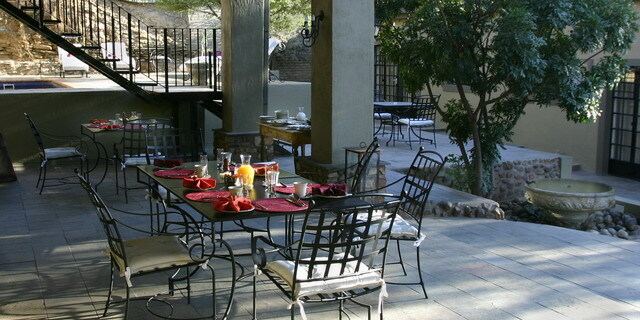 For more area specific information and accommodation options, please visit our Destination Map. 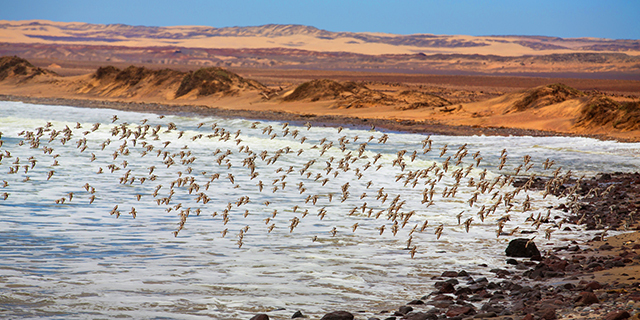 In the extremely remote north-western corner of Namibia lie the Skeleton Coast and Kunene River. This is the most unspoiled and diverse region of Namibia, representing a microcosm of the Namib Desert, with everything from roaring sand dunes to mountains, salt pans to oases, desert elephants to rare brown hyenas, as well as the Kunene River and the eerily beautiful Skeleton Coast. 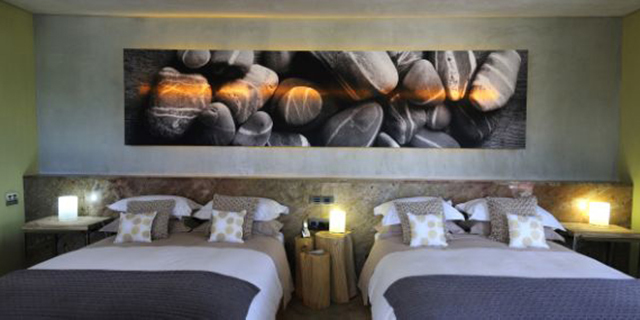 This is also the home of the highly traditional Himba people, providing an opportunity for one of the most authentic cultural experiences in southern Africa. The colossal red dunes of Sossusvlei are one of the iconic images of Namibia. Towering 1,200 feet above the desert floor, these are said to be the tallest sand dunes in the world. Sossusvlei translates to "the gathering place of water" in the local Nama language and, as improbable as it might seem, during years of good rainfall, water from the surrounding mountains runs off into the pans of Sossusvlei creating temporary lakes that reflect the rich colors of dune and sky. Damaraland, lying just inland from the Skeleton Coast, represents the mountainous face of the Namib Desert. In addition to spectacular vistas, this area is famous for its desert rhino and elephant populations. The rhinos of Damaraland are not only Africa’s sole desert rhino population, they are also the last truly free ranging black rhinos on the continent. The Etosha National Park is Namibia’s premier wildlife safari destination. The Park itself is almost 8,000 square miles in size, encompassing all 2,000 square miles of the vast Etosha Pan as well as the mopane woodland and acacia bushveld that surround it. Visitors to Etosha have the possibility of seeing the “Big Five”, as well as other rare and localized species such as black-faced impala and mountain zebra. 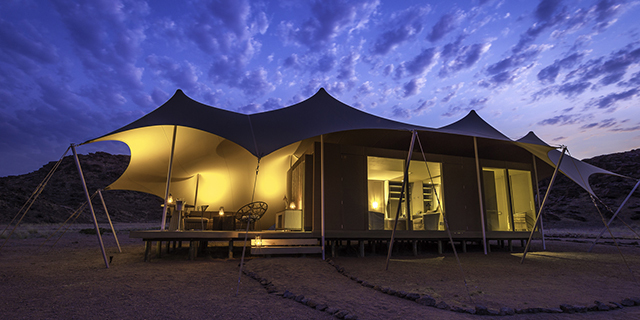 Namibia features accommodation options ranging from ultra-luxurious safari lodges to some of the most remote tented safari camps anywhere in Africa. As the driest African country south of the Sahara, Namibia is a year round destination that can be visited on its own or in combination with one or more of the other countries of southern Africa. 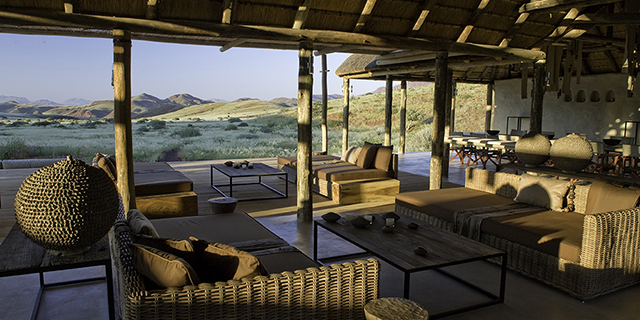 Classic Africa offers both tailor-made and small group safari options to Namibia.